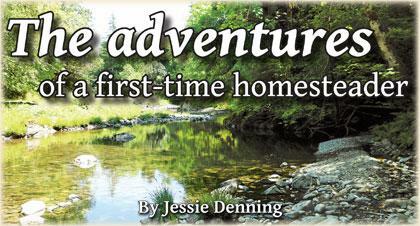 In November of 2015, my husband and I moved onto our 50-acre parcel of land in a 28-foot travel trailer — with no knowledge of homesteading except what we’ve read in the pages of Backwoods Home Magazine. Within a couple months of moving, we tore down the ramshackle, 1920s-era house on the property, using only hand tools and a small tractor we borrowed from my father-in-law. 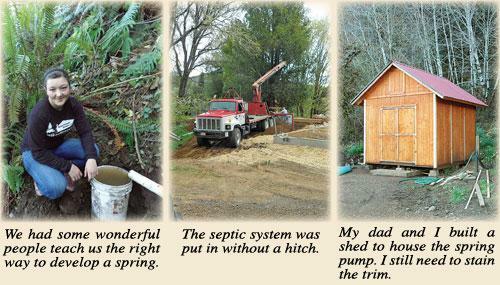 We then developed a spring near the house, built a shed to house the pump for it (and provide much-needed storage), and got the numerous required permits to build a new house on top of where the old one stood. It’s been a whirlwind of activity, with my husband and I both working full-time and devoting weekends to working on our property. My husband, Tim, has a degree in Forest Management and works as a wildland firefighter during the summer. He has big plans to grow trees so we can provide our own lumber, but for now, he’s the one in charge of cutting down dead trees and burning all the brush piles. 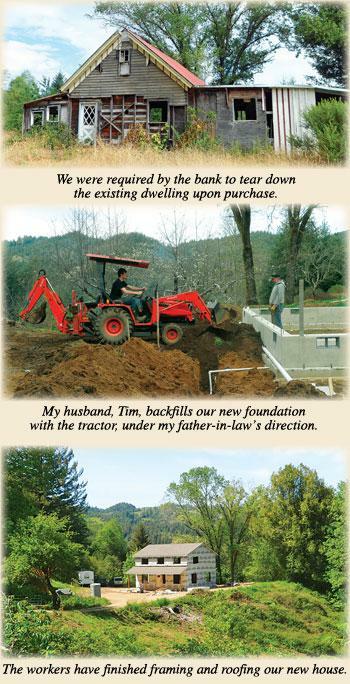 Once our permit applications were processed and our bank loan came through, the contractors started working on our house. Although it is my dream to one day build my own house, our county planning department allows only one year in which to replace an old dwelling with a new one — not enough time for a novice builder to construct a house. Instead, we hired a construction company to build it. Here’s a tip: If you build a big, square house with four corners, it’s cheaper than building a smaller house with more corners. Since we didn’t have to work on building our house, my husband and I turned our efforts to something much less glamorous: clearing brush and hauling trash. I never realized how much of a homesteader’s job is simply reclaiming land that has been overrun with weeds. The previous owners had also left huge heaps of garbage lying everywhere. So far, we have taken 20 truckloads of trash to the dump, and we still have more to go. Once we finished clearing what we could by hand (to unearth any hidden piles of metal), we used the tractor to clear out our orchard. Still, it was slow going, and we were able to borrow the tractor only every once in a while. Luckily, a kind gentleman who knows my family volunteered to bring his bulldozer up and clear our field of blackberries and thistles. In the space of three days, he cleared and smoothed probably three acres’ worth of land. With our field cleared, it was time to set up a garden. We wanted one that was a manageable size for this first year, so we settled on a 15×30-foot space. We had salvaged six 10-foot 4x4s from one of the trash piles, so we used those as posts, dug 3½ feet into the ground. I constructed a simple door out of 2x4s. With our posts in place, all we needed was fencing. I waited until we saved up enough money, then went down to the local feed store and ordered 800 feet of 2×4-inch welded wire fencing (for future fencing projects) to keep out deer and smaller critters. The ladies that run the store said it was lucky that I purchased the wire when I did, since the very next day the price went up by $30 per 100-foot roll. At that time, I also bought some U-tacks to secure the fencing. This was where things started to get hard. I had always taken fences for granted, but I will never make that mistake again. As we started to stretch the first section of fencing (using a come-along, a chain, and a truck), the post started to move. We forgot about bracing the corner. We grabbed some more salvaged wood and quickly made some diagonal braces on both sides of each corner post. In the end, we got the fence up just fine, and we learned a lot along the way. To amend the garden soil, I added some well-rotted chicken manure with a mulch of wood chips. Wood chips tend to lock up the nitrogen in the soil, so in addition to adding extra nitrogen to the soil, we are also planting beans as a cover crop. After harvesting, we will till the plants into the soil, thus adding even more nitrogen. The garden was previously a huge field full of thistles and blackberries, so to combat those weeds organically, we purchased a propane weed torch that burns at 500,000 BTUs. It seems to be doing the trick, although we will have to be diligent. 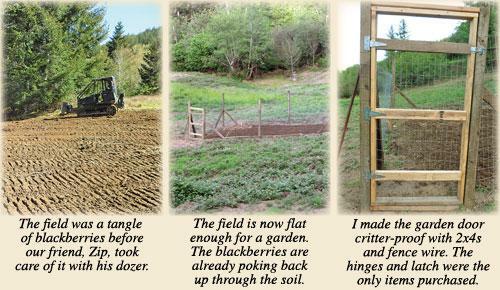 With the garden fence project fresh in our minds, we approached the 700-foot orchard fence more carefully. We needed this fence to protect our existing fruit trees (three cherries, two apples, a peach, and a nectarine) as well as all the fruit trees we plan on planting in the future. Additionally, this fence will keep our chickens contained while they free-range during the day, which is what BHM writer Jackie Clay-Atkinson does. We decided to use H-braces for the fence corner, so that we wouldn’t have any issues with the posts moving. 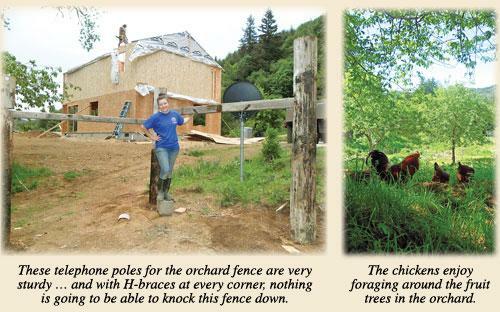 We used old telephone poles for the orchard fencing, as they are free from the local power company. My husband and I wanted to get moving on the orchard fence, so we didn’t wait for his family’s tractor and auger attachment to become available. Instead, we grabbed some post hole diggers ($7 at a garage sale) and set about digging 3½-foot holes about 12 inches in diameter. Once we put the pole in the hole, we filled in the hole with gravel, then topped it with dirt. We have dug only about 15 holes so far, with approximately 35 left to go. But until the auger is available, at least we’re making progress. Even though right now my adventures in homesteading mostly consist of brush clearing and good old manual labor, I know that we are laying down the groundwork for the future. One day, we will have a finished farmhouse, a productive garden, rolling hills of pasture surrounded by sturdy fences, and happy livestock wandering in and out of their barn. It’s going to take a while to get there, but we’re committed to putting in the time, effort, and money in order to fulfill our dream of living a simpler life.